With an NFC-enabled Nook, you could “walk up to any of our pictures, any [of] our aisles, any of our bestseller lists, and just touch the book, and get information on that physical book on your Nook and have some frictionless purchase experience. That’s coming, and we could lead in that area,” the US bookseller’s CEO has told Fortune. 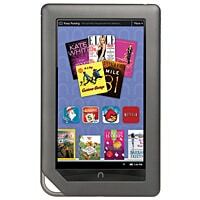 B&N CEO: "We're going to start embedding NFC chips into our Nooks"
US bookseller Barnes & Noble is to add NFC functionality to its Nook e-reader, CEO William Lynch has told Fortune. Key to the addition of NFC to the Nook will be the ability to integrate the company’s online and offline business, Lynch told Fortune. “We feel like we still have a lot of opportunity in the offline-online integration, and how we integrate stores,” he explained. “We’ve done I think one of the better jobs in terms of creating a Nook experience in our stores to really improve the overall consumer experience… But I think there are things we have yet to do. If we had more time, I would try to figure out how to unlock cool experiences. “I’ll give you a perfect example,” Lynch added. “We’re going to start embedding NFC chips into our Nooks. We can work with the publishers so they would ship a copy of each hardcover with an NFC chip embedded with all the editorial reviews they can get on BN.com. “And is that NFC experience rolling out this year?,” Fortune asked Lynch. “Maybe…”, he replied.